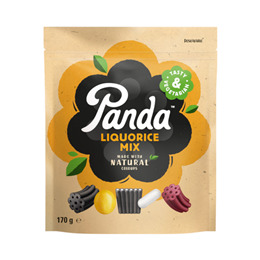 Panda Liquorice Mix is an assortment of all your favourite Panda liquorice pieces in one sharing bag. Open up and enjoy! Molasses syrup, wheat flour, sugar, cocoa butter, liquorice extract, vegetable fats (palm kernel, palm, shea kernel), whole milk powder, cocoa mass, rice starch, maize starch, glucose syrup, thickener (gum arabic), pasteurised raspberry puree, glazing agents (carnauba wax, vegetable oils [coconut, rapeseed]), acidity regulator (citric acid), skimmed milk powder, flavourings (e.g. aniseed oil, peppermint oil, vanillin), emulsifier (lecithin), colours (curcumin, beta-carotene). Content of the mixture may vary. Yellow dragee contains milk chocolate. 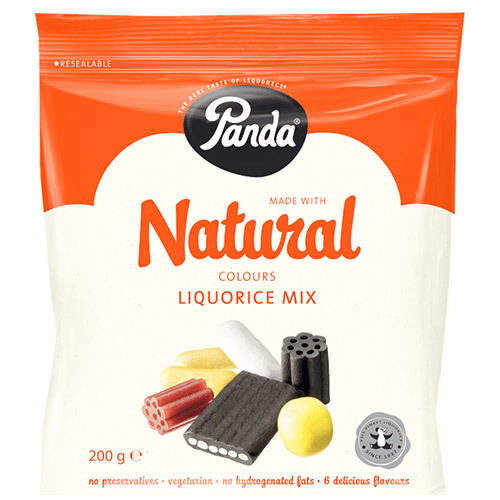 Below are reviews of Panda Liquorice Mix - 200g by bodykind customers. If you have tried this product we'd love to hear what you think so please leave a review.